Saturday 3rd November 2018 – The Deputy Mayor, Councillor Maggie Gray attended the Lions Club Annual Charter Dinner held at the Royal Arthur Suite at Butlins. Thursday 8th November 2018 – The Deputy Mayor, Councillor Maggie Gray was present at the induction Mass at the Sacred Heart Roman Catholic Church to welcome the new Priest Father Dominic O'Connor. Friday 9th November 2018 – The Deputy Mayor, Councillor Maggie Gray attended a charity evening at the Crown Hotel raising money for the Firefighters Charity. Saturday 10th November 2018 – The Deputy Mayor, Councillor Maggie Gray helped to present the prizes for the AMCA Beach Race at Busters Fun Pub. 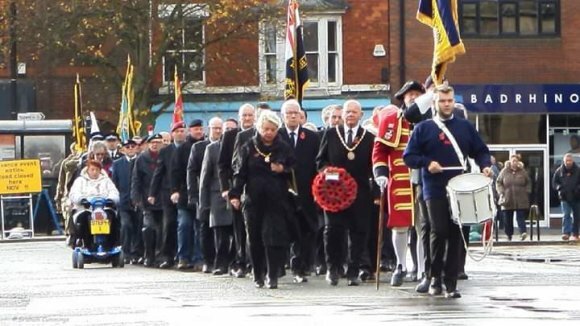 Sunday 11th November 2018 – lead the Remembrance Day Parade and laid a wreath at the memorial. 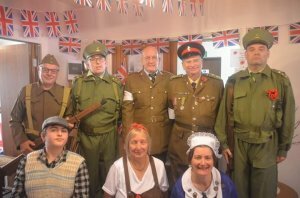 Sunday 11th November 2018 – Opened the Philip Grove Community Centre 1940's Remembered event. Sunday 11th November 2018 – The Deputy Mayor, Councillor Maggie Gray helped to present the prizes at the AMCA Beach Race awards evening at Busters Fun Pub. Sunday 11th November 2018 – The Deputy Mayor, Councillor Maggie Gray attended the Town Criers event "A cry for Peace" at the Hildreds Centre. 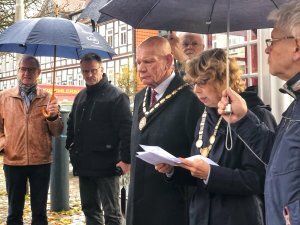 Tuesday 13th November 2018 - The Town Mayor attended a commemoration ceremony to mark the end of the first World war in the main square of our Twin Town, Bad Gandersheim, Germany. 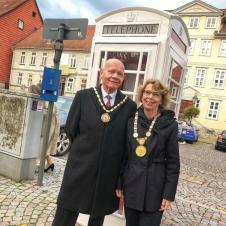 The ceremony was centered around "The Box", an old British telephone box painted white to represent peace with the names of the fallen from both Towns written inside. The names were read out by the Mayors from both Towns in a moving tribute. Tuesday 13th November 2018 – The Deputy Mayor, Councillor Maggie Gray helped to award certificates to students at the Skegness Vocational College presentation event held at The Pavilion, Skegness Rugby Club. Friday 16th November 2018 – Watched the Embassy Theatre Academy's annual community variety show in aid of Children in Need. Friday 23rd November 2018 – The Deputy Mayor, Councillor Maggie Gray attended the 30th anniversary celebrations of Westcotes Residential Home. Sunday 25th November 2018 – The Deputy Mayor, Councillor Maggie Gray helped to present the awards at the Lisa Jay Stage Institute awards ceremony held at the Skegness Academy Theatre. Sunday 25th November 2018 – Was invited by the Grand Order of Water Rats to attend their Annual Ball at the Grosvenor House Hotel, London. Thursday 29th November 2018 – Attended a photoshoot for The National Lottery to publicise the missing Euromillions ticket, also did an interview for Channel 5 News. Thursday 29th November 2018 – Visited the Forest Tots Parent and Toddler group held at the Eco Centre where he learnt more about what they do, their £74,000 Lottery Grant and planted a tree. Friday 30th November 2018 – The Deputy Mayor, Councillor Maggie Gray attended the Phillip Grove Community Centre cheque presentation for money raised from their 1940's Remembered event. Friday 30th November 2018 – Took part in the Parade and the Skegness Christmas lights Switch On event outside the Hildreds. Friday 30th November 2018 – Attended the Skegness Business Awards at Southview Hotel.